Upstairs, “three stories up”, you find dark nooks and crannies that open up on spacious ballrooms shimmering with light. Swaying waltzes merge into acoustic loops, improvisation, chilly soundscapes and then into uncompromising, full-throttle folk. Following on their acclaimed album Rust, Kaja is poised to release their third album Tre Trappor Upp (“Three Stories Up”). Nearly a decade together has honed Kaja into a genre of their own, an irresistible flowering of musical expressions. Rooted in Eastern European music, it finds nourishment in the borderlands between tradition and innovation. Kaja has always had a soft spot for Rumanian and Balkan beats, only now they have forged their own musical language by layering on more dimensions, richer content. They explore klezmer, tango, Swedish folk, French waltzes, improvisation and cinematic art music. 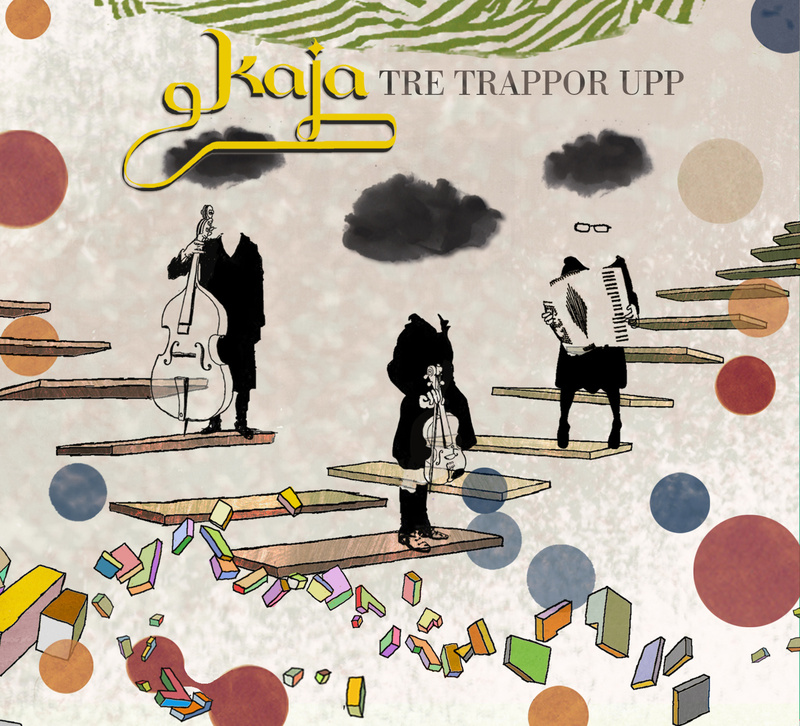 Their new release, Tre Trappor Upp, displays further influences from American folk music, acoustic club music and Indian ragas – all wrapped up in a full-bodied sound. The results are a unique brand of daring and dazzling chamber folk, full of edgy twists and turns. Where the three musicians comes together in a classy collaboration with a playful yet powerful voice. The tracks on Tre Trappor Upp evolved in a winter wonderland by the sea in Saltsjö-Boo and at the legendary Teater Aftonstjärnan in Gothenburg. During the process, Kaja encountered the inspirational spoken word poet Olivia Bergdahl. She has composed nine poems, one for each track, that will be included in the vinyl edition of Tre Trappor Upp. The magical artwork on both sleeves is by Yusuke Nagano.